Track your employees in real-time from your desktop or mobile. 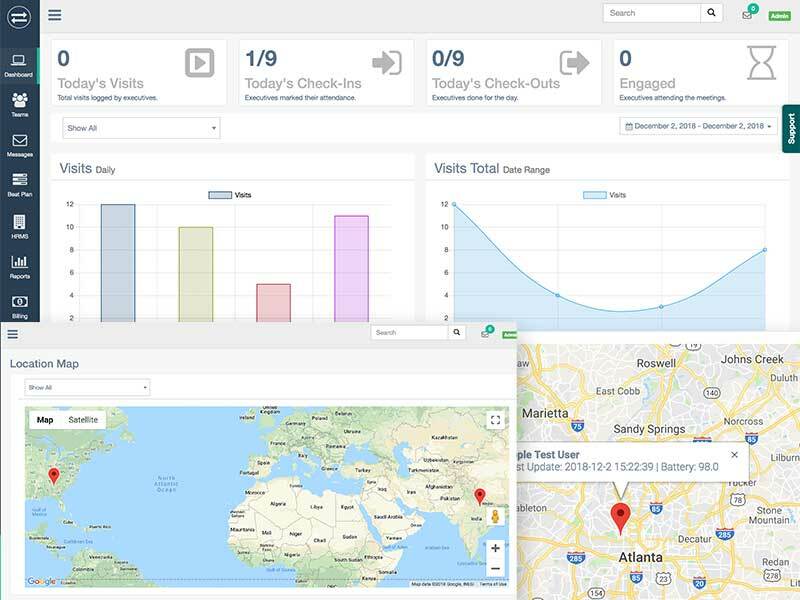 Automated reports, alerts and geo-tagged attendance with performance analysis. TeamSpoor is the world's only free employee tracking app, which is free for life time with unlimited users. Track your real-time location during their working hours. Also, get alerts when somebody is wasting their time. Beautiful and informational graphs to judge the performance of your on-field staff and teams. Real-time reporting allows faster decision making and upto date data from the field staff all the time. Track attendance right from the app with geo location and also get visits reports in real time. Track real time location of all your employees all day long right from your mobile. Location data comes with route map, which enables you to determine whether your employees were working or not. Extra components to manage your business better. Our HRMS components help companies in their payroll. From automatic conveyance calculator to leave & attendance management to expense manager. Automatically calculates the distance traveled by your team from checked-in time to checked-out time. No more guess work. Manage leaves right from the TeamSpoor app. No more sending mails and missed communications. Allow managers or HRs to approve/reject in a click of button. Upload the expenses right from the mobile in real-time with an image of the bill. No more paper work and missed reimbursements. Manage your field force right from your computer. Works anywhere in the world, offline or online. Real-time reporting ensures highest productivity. 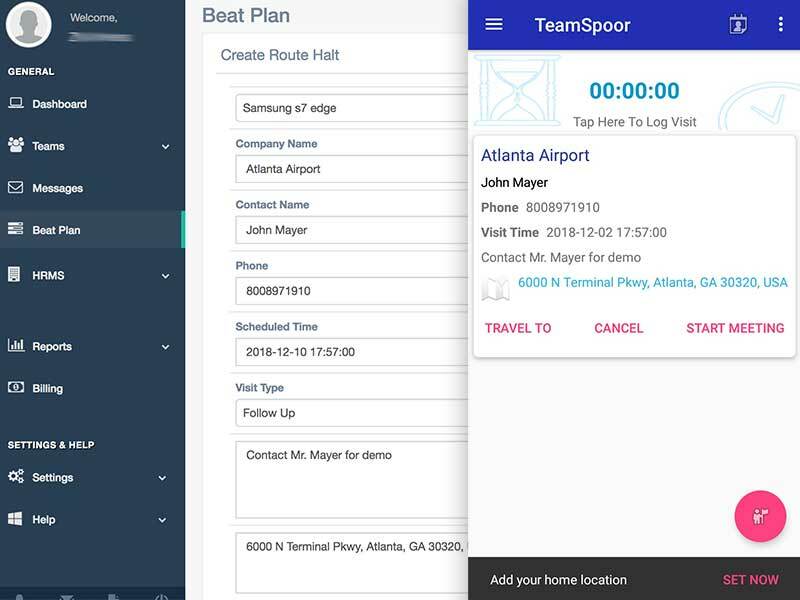 TeamSpoor is a field force management software, which provides real-time employee location tracking, performance analytics, attendance and leave management, time-sheet, route distance calculator and real-time reporting. TeamSpoor helps managers and senior management to track the performance of their field or remote staff in real-time and fill the revenue leaks. Is this free employee tracking app? Yes, it is a free employee tracking app with life time validity for unlimited users. Add as many employees you want and you can track them in real time. Is Route Distance Calculator available in free plan? No, route distance calculator is only available in our enterprise plan. What are the prerequisite of getting the service? 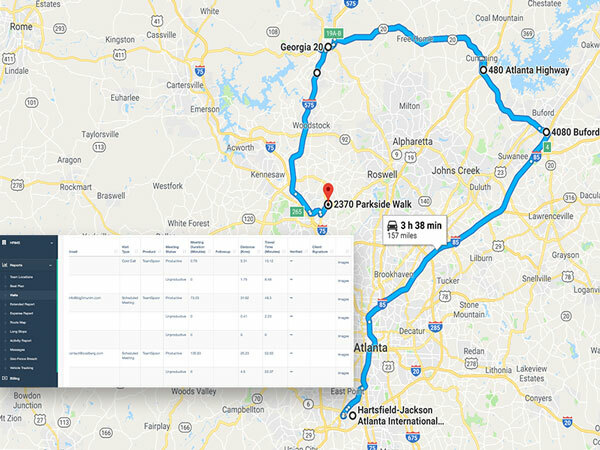 To start the tracking, your employees must have a smart phone running Android 4.4+ or iOS 8 with an active data plan (internet connectivity). Also, the smartphone should support GPS functionality. TeamSpoor provides real-time employee location tracking, reporting automation, attendance & timesheet and performace analytics and more in a small package.